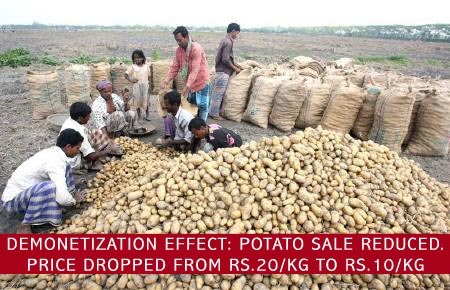 Checks on terrorism, corruption and counterfeit money, lower interest rates, lower property rates, increased tax collection and lower taxes... these are the obvious effects of demonetization that everyone has talked about. But there are some indirect/cascading effects that nobody cares to mention. Or maybe they don't even notice it? This post is about those effects. I said it in my previous post, and I'm saying it again. The way people have patiently stood in queues, and supported the move, despite all the problems they faced, is beyond anything that I could have ever imagined from this country. Those who have experience working with teams will know what I mean. Even 125 people can turn into an angry, destructive, uncontrollable "mob". But here, we had over 1.25 billion people... with different temperaments, different backgrounds, different literacy levels, different personal challenges... and they all worked together in allowing this operation to complete peacefully. The whole world was keeping an eye on India during those 50 days of demonetization, and the impression that has been conveyed to them is that of a united nation, a strong nation, a nation that is willing to work together with its elected leader. That is some global statement. This operation has already started creating awareness about digital modes of payment, in the so-called 'uneducated' sector. And I'm not talking about that tea vendor interviewed on TV, or even that chana-jor-garam-waala whose picture was circulating on Whatsapp and Facebook. I'm talking about people I've personally seen. When I was out shopping with my sister (in the first week of December), I saw a long line of autos at an auto-stand here. One of them had a paytm sticker on it. (By now, probably, there are a lot more of them.) Similarly, there is this street in Vaishali Nagar, lined with food vendors on both sides. (Golgappe, momos, chowmein, pav bhaji, you name it!) I saw the paytm sticker on one of those thelas too. There's an 18-year-old maid in my building, who didn't get her Aadhaar card made because she was camera shy! After demonetization, her employer refused to pay her salary in cash. But she needed the Aadhaar card to open her Jan-dhan bank account. So she was forced to overcome her inhibitions finally. Youngest of 4 sisters, she's the only female in her family who can read and write (thanks to that same employer). Her mother, who is also a maid in my building, used to say very proudly that she hadn't sent any of her daughters to school! But now, when they've all had to open their bank accounts, she realizes the importance of education, even for girls. My own maid is comparatively more progressive. She already has her Aadhaar card (although it is currently at her permanent residence in her village). She doesn't have her own bank account, but she's already learnt how to deposit money through Cash Deposit Machines. The day Mr. Modi announced about demonetization, she said she simply took all her cash and deposited it into the "ATM", in her brother's account. Now she is super excited about getting her own bank account. "Main to kabhi bank ke andar nahi gaya, abhi khaata khul jayega mera? Wahan to sab saahab log aata hai! Aur main bhi jayega! Paisa seedha khaate mein chale jaayega? Aap kompooter se bhejega na? Fir main card se nikalega usko? ATM mein se?" She kept on blabbering like a little girl! Reminded me of the time when I first went to the bank... alone! That sense of pride, on learning to do something new! Human psychology is weird. Most people resist change and are scared to adopt the new. Sometimes, we need to be pushed out of our comfort zones. This demonetization exercise has provided that necessary push, and forced people to embrace technology and growth. 50 days of PM Modi's big demonetization "experiment" are over. The whole world has been watching India in those 50 days. A lot has been said and written about it in those 50 days. I'm no economist. And I'm not going to pretend to be one for the sake of this article. I'm just going to share my experiences and observations during those 50 days of demonetization. 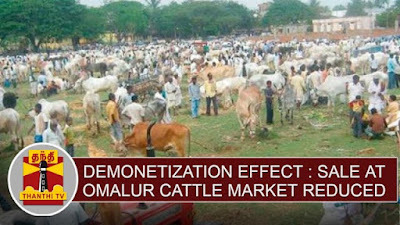 In a country with 1.25 billion people, scrapping 86% of the total currency in circulation, is bound to create problems. It cannot possibly be a seamless transition. Considering the magnitude of the operation, I have to say, this entire operation happened more smoothly than I expected. 2. Queues Outside Banks and ATMs. I didn't go to the ATM even once in 50 days, although I was tipped off that our neighborhood ATM (State Bank group) gets filled at around 6 pm every day. As for banks, my first trip to the bank (SBI) was on 19th November, the day when cash exchange was allowed only for senior citizens. So the queue was considerably shorter. Still, it took us (Dad & me) an hour. But the queue was extremely well-behaved, the guard had full authority to deal with trouble-makers, senior citizens were being sent in first, and there was a table outside with drinking water and deposit/withdrawal slips. By the time our turn came though, Rs.100 notes were finished. 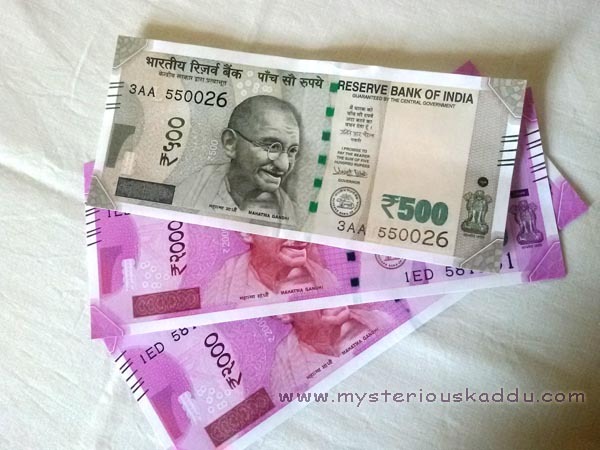 We could choose from Rs.2000 or Rs.10 notes. But they did have sufficient cash. The second time we went to the bank was on 6th December. There was no queue, normal crowd inside. We were in and out within 3 minutes. Sufficient cash, but again no Rs.100 or new Rs.500 notes. Our local vegetable vendor had a severe cash crisis the very first morning, i.e. 9th November. He went to the mandi to buy fresh vegetables for the day, but nobody would accept the old Rs.500 and Rs.1000 notes. Eventually, they just gave him the fresh stock on credit, as he buys from them every morning. I personally didn't face any major cash crunch problem, because sales at a neighborhood stationery store happen in petty cash mostly. Salaried people would have been in a real tight spot though. 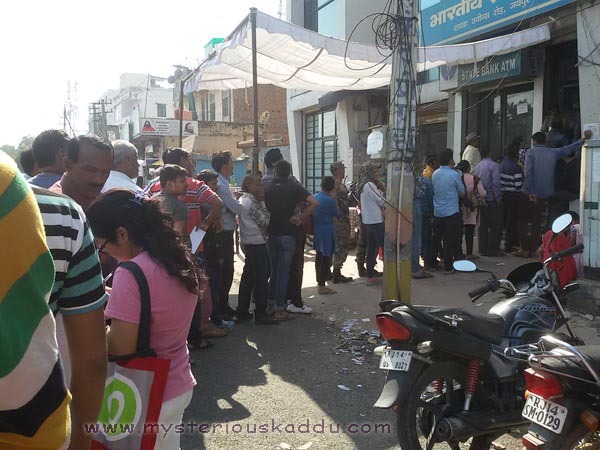 Limit on ATM withdrawals, long queues, not enough small denomination currency. Can't imagine how they managed, especially for the first couple of weeks. For the first few days (less than a week), yes, sales dipped. People were buying only the necessities. But things got more-or-less normal soon after. My sister was here in the first week of December. We did a lot of shopping then. Most stores accepted cards, and the ones that didn't, had sufficient change for Rs.2000 notes. Overall, I didn't see much difference in retail markets. But yes, wholesale markets seemed slower than normal. There were fewer customers there (even in December) AND less stock too. Neighborhood shops may not have POS machines, but they have other support mechanisms, because the residents and shop owners are all usually known to each other. In my colony, some regular customers were given goods on credit. Others could open their "pre-paid accounts" with our local kirana store and vegetable vendor, with the otherwise-useless Rs.2000 note. I installed paytm on my phone, to accept payments from customers who didn't have cash. But one lady didn't want to use paytm either, 'coz she badly needed change for her Rs.2000 note. So the kirana store and I pooled in our Rs.100 notes, to help her out. Residents have also been helping their domestic maids with small cash advances, as well as in getting their Aadhaar cards and new bank accounts. Together, we have pulled through. These last 50 days have witnessed a strange phenomenon. There were very few takers for the Rs.2000 note. The Rs.100 note suddenly became more valuable than the Rs.2000 note. Even Rs.10 notes, from kids' gullaks, became more valuable than the new pink note. And the new Rs.500 notes are still like those rare Colombian emeralds! Everybody wants them, and the few who do have them, show them off like Sharukh Khan's Nerolac-painted-house in that "ghar bula ke to dekho" TV ad. Yes, this operation required a high level of secrecy in order to be successful. Despite that, Team-Modi could have been slightly better prepared. I mean, some of the loopholes were pretty obvious. Daily cash exchange, misuse of Jan-dhan accounts, opening of new fake accounts, jewellery purchase. They could have anticipated at least these few loopholes, and taken proactive steps against their exploitation. Many people got carried away in their greed and misconception, and exploited the various loopholes. The railway ticket route was effectively blocked right away. Jewellery stores are already under the scanner. Deposits in fake accounts and other people's accounts can easily be flagged with the use of software. Contrary to what most people believe, they don't need to scan all bank accounts manually. A simple query can reveal all suspicious transactions in any bank account. Multiple bank accounts can be linked by PAN numbers. Non-KYC accounts can anyway be flagged for further inspection. It's not as difficult as some people would have you believe. But it will take time and continued vigilance by Team-Modi. All culprits can be caught if Team-Modi wants them to get caught. In India, all government bodies are known for their bureaucratic procedures and lack of decision-making will. They usually take ages to act on any matter. As such, I found it a pleasant surprise that Team-Modi was constantly on its toes and ready to take immediate action. Some people may ridicule them for making "54 changes in 42 days" (or whatever the final numbers were), but I thought it was a welcome change from their usual inertia. 10. The People of India. I am truly amazed! The way everyone stood patiently in queues, without creating any law & order problem, despite the magnitude of the operation, AND the constant provocation by news reporters and opposition members... it is just incredible! I would have never, in my wildest imagination, thought it possible. They must have a lot of faith in Mr. Modi. 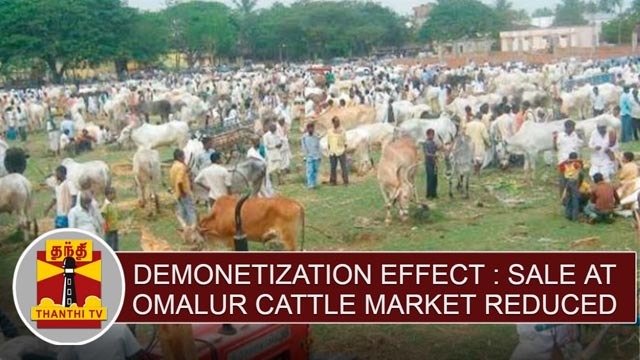 The demonetization drive was a necessary step, but, by no means was this the final step. Whether it was successful in achieving its intended objectives or not, only time will tell. Time, and continued action on the part of Team Modi. But it has set in motion certain things that would not have happened so soon otherwise. This article has already become too long, so I will write about them in my next post. The year 2016 has been more or less uneventful for me. Long drawn. Lazy even. I had high expectations from it in the beginning, but then injured my shoulder early on, and got distracted with other stuff. I just don't feel like writing anymore. I don't feel like recording bits from my life here. Or anywhere else, for that matter. I say 'anymore', but maybe it's just a temporary phase. I sure hope so. Otherwise, life has been good this last year. Except for those few months when I was struggling with the physiotherapy, pain and sleep deprivation. But, as they say, "What doesn't kill you makes you stronger." I, for one, definitely DO feel stronger than I did at the start of 2016. More optimistic about life. More in control. More appreciative of what I have and where I am. 2016 has been a good year, even if it didn't seem so at times. And 2017 is still waiting to be written. I don't have any New Year Resolutions. Never make them. So I'll just go with the flow and think about each day when it comes. What about you guys? How was 2016 for you? Do you have any plans/goals for 2017? Do share them below. 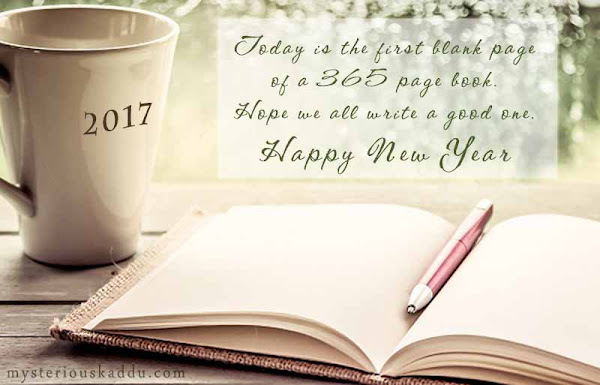 Wish you all a Very Happy New Year, friends!